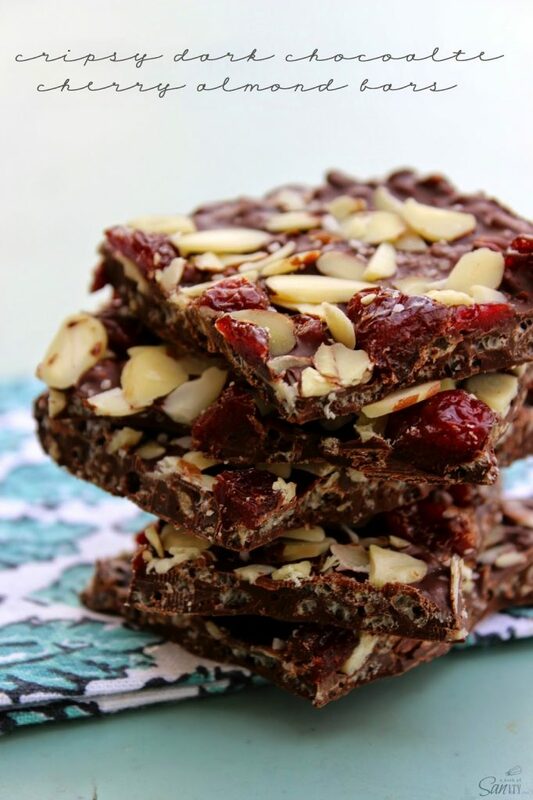 Crispy Dark Chocolate Cherry & Almond Bars have all the elements of a perfect bite of chocolate and make for a great afternoon pick me up. 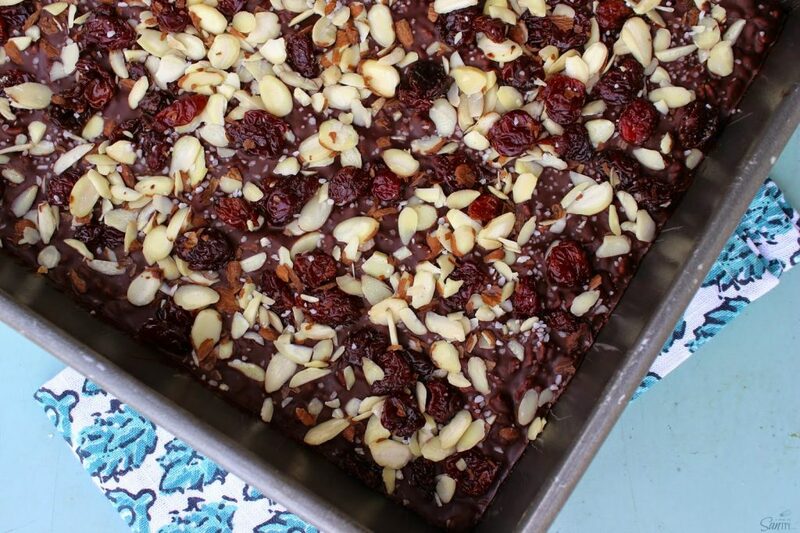 Made with dark chocolate, rice cereal, a dash of coarse sea salt, dried cherries and slivered almonds, a simple and quick recipe that taste like my favorite Kind bar. 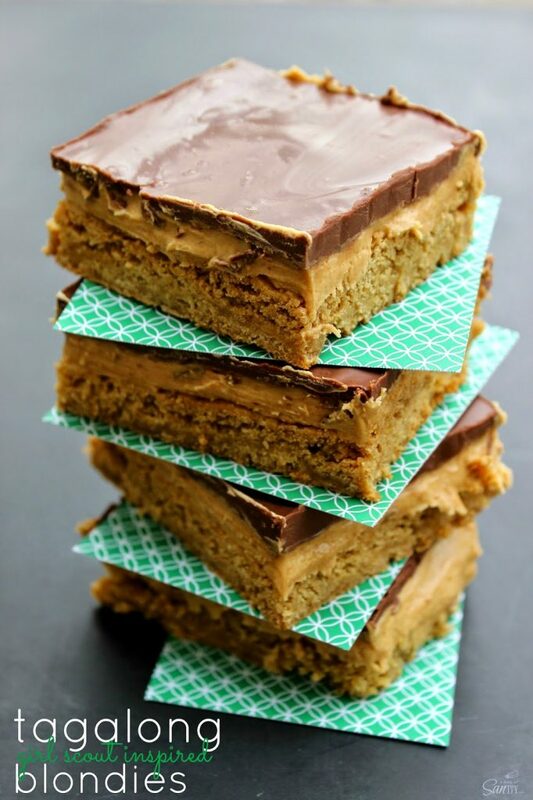 Simple recipes are another key to my sanity, so when I saw a recipe out of one of my new favorite cook books called Guilt-Free Girl Desserts, I knew I would need to make this ASAP. With a couple of changes this became a hit for me and my kids, which I was surprised because of the dried fruit and nuts. 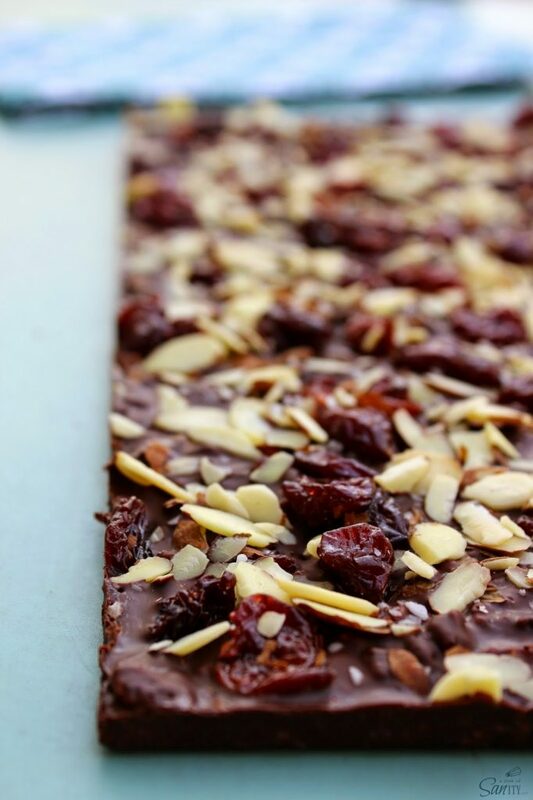 These Crispy Dark Chocolate Cherry & Almond Bars are a perfect afternoon treat and just one little bars is enough, and I found that I got a little more energy from this, then just straight up chocolate chips. Maybe it’s the nuts, I don’t know. But I am literally in love with these bars. While you can’t taste the rice cereal, it offers a nice crunch. 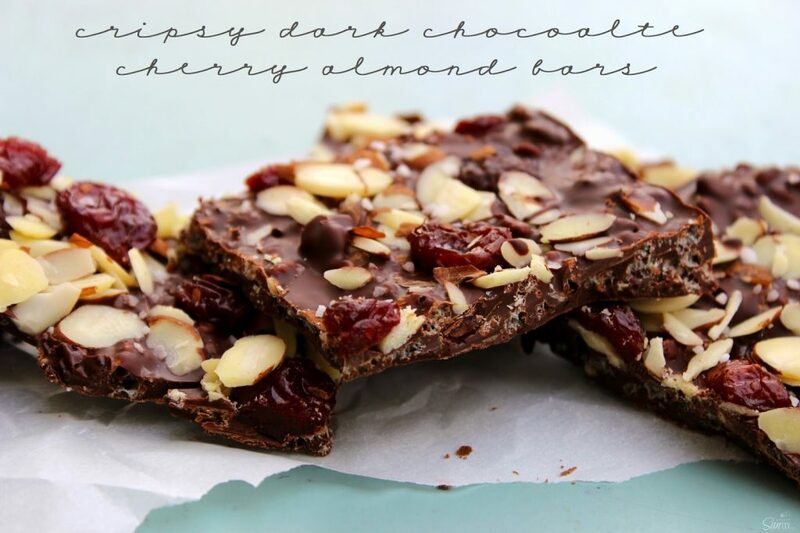 Easy to prepare and a fantastic snack, these Crispy Dark Chocolate Cherry & Almond Bars are great treat to have around and even better shared. With cooking oil spray a 9×13 metal pan and set aside. You could also just line it with parchment as well. In a small bowl combine almonds and cherries and mix together, set aside. Using a double broiler, or what I do is get a large sauce pan, fill it with 1/3 of water, and then set a glass bowl in it. The glass bowl must cover the entire top of the pan and fit like a lid, so that the water does not get into the bowl. Once the water is gently simmering, add chocolate into the top of the broiler or glass bowl. Stir the chocolate frequently until completely melted. Remove the chocolate from heat and stir in rice cereal. Pour the chocolate and rice cereal mixture into the prepared pan into a nice smooth and thin layer, evenly spreading. Immediately sprinkle the almonds and cherries evenly over the chocolate, then using a spatula press the almonds and cherries into the chocolate. Sprinkle with coarse sea salt, to taste. Set pan in the refrigerator for 1 hour or until set. 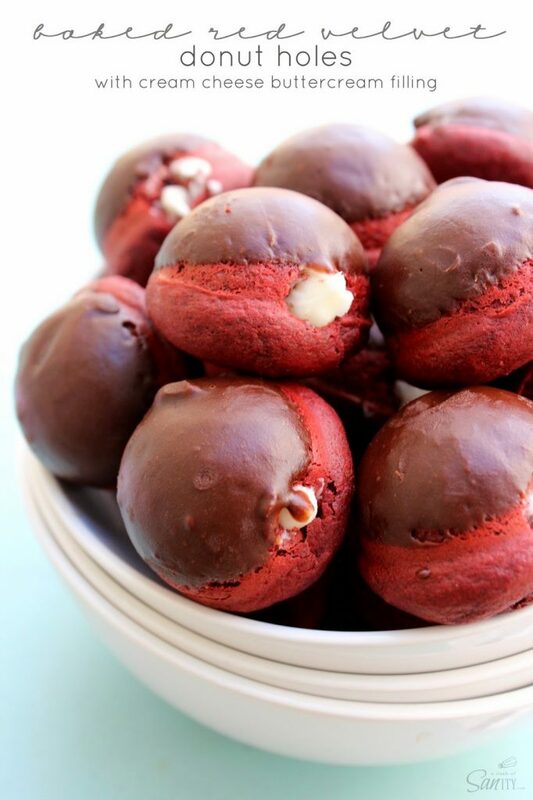 Remove chocolate from pan and cut into pieces. 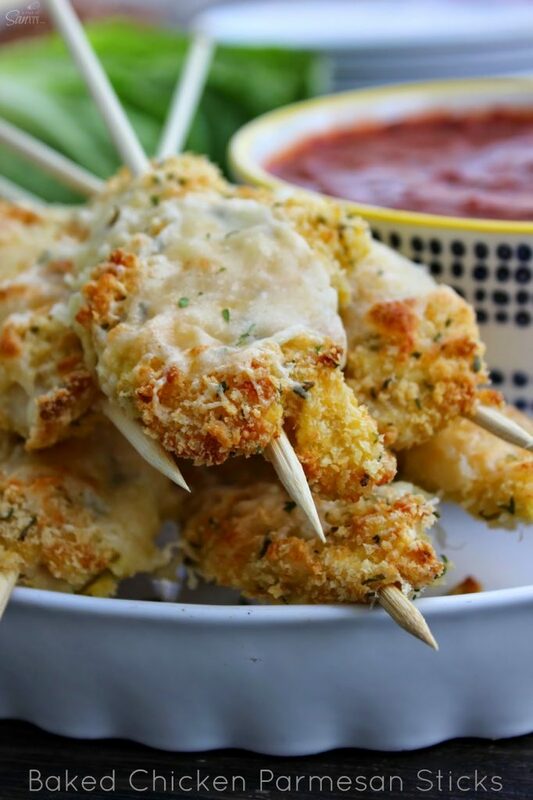 Here are some of my favorite winter recipes, hope you come over and check them out.